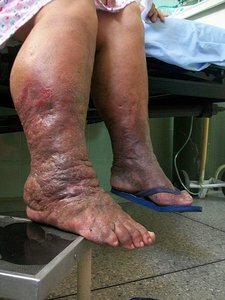 Lymphedema physical therapy addresses blockage in the lymph nodes that prevents proper drainage of lymph — a fluid that transports bacteria to the lymph nodes where they are destroyed — throughout the body, which causes severe swelling in the affected limbs. Lymphedema physical therapy consists of massage, manual drainage of the blocked lymph fluid, and management of the condition with compression garments. Elevation and treatment with air compressed bladders may also be used to normalize the size of the limb. The therapy is typically introduced by a specially trained physical therapist in a medical facility and then continued daily by the patient and a caregiver at home. Massage of the limbs is one of the first steps in lymphedema physical therapy. Daily practice of a method of sequential massage called complex decongestive therapy (CDT) is often prescribed. A therapist performs the routine in the early stages, with the goal of decreasing swelling in the affected limb. The process works by focusing pressure on the limb, which moves blocked lymph fluid through the body. Once the limb is down to normal size, the exercises can be taught to family and friends of the patient, who will continue the daily routine in order to prevent future swelling. Exercises for lymphedema: Since lymphedema's symptoms can only be controlled and not cured, it is important to take diligent care of the affected limb or limbs. If you engage in light exercise that moves the arm or leg affected by lymphedema, it may aid the flow of lymph fluid.It is essential that you engage in light exercise only. Strenuous exercise will only make the affected limb tired. Your physical therapist will help you learn exercises that are designed to gently contract the muscles, thereby pushing the lymph fluid out of the area. Physical therapy may also include elevation of the limb and compression with air bladders. Both methods help to move lymph in the proper direction. Elevation uses gravity to encourage the lymph to move, while compression with intermittently pulsing air bladders can also help to squeeze it through the body. Once the lymph fluid has been unblocked, it must be drained from the body. A tube is inserted near the swollen limb — such as in the armpit area for drainage from an affected arm — whereby the unblocked fluid and the masses that caused the blockage can be removed. The lymph is squeezed through the tube manually and deposited into a bag connected to the tube. Compression garments are key elements in continuing lymphedema therapy. They are typically tubes of stretchy, elastic material that look similar to a cloth bandage, which are stretched over the limb in question. The pressure from the tube keeps the limb from swelling up due to build up of lymph fluid. In order to be effective, the patients must be measured by a medical professional, after which the garment is custom made. Compression garments are typically worn every day and taken off for short periods such as for bathing or sleep. Patients undergoing physical therapy can take several other actions to improve its effects. It can be helpful to avoid binding clothing and salty or spicy foods. Continued regular elevation of the affected limb can aid in drainage and relieve pressure. It is also important to keep skin clean, dry, and well moisturized in order to avoid infection.